Ramsay Hunt Syndrome is a condition that affects the facial nerve and associated structures, which can lead to hearing loss, a blister-like rash, and facial paralysis. It is believed that Ramsay Hunt Syndrome is caused by the reactivation of the varicella zoster virus- the same virus that causes chicken pox. The virus can lay dormant for years, and later become reactivated causing Ramsay Hunt Syndrome. The condition often presents as a painful blistering rash around the ear. Hearing loss in the affected ear is also common, as well as temporary facial paralysis. One of the most important steps that patients can take is to seek medical help right away if they feel that they may have Ramsay Hunt Syndrome. Most likely, they will be given a high dose of antiviral medications which will help treat the current symptoms and prevent further complications. Furthermore, an additional high dose of steroids such as prednisone may be required. Seeking immediate treatment is very important as it may help prevent severe or permanent facial paralysis. Ramsay Hunt syndrome is often misdiagnosed as Bell’s Palsy which does not typically have rash or hearing loss associated with facial paralysis. Bell’s palsy occurs as a result of the Herpes Virus Reactivation and tends to have a better outcome in the majority of patients than Ramsay Hunt. Unfortunately, many patients who have been formally diagnosed with Ramsay Hunt Syndrome and have been placed on the proper medications may still be left with residual symptoms of facial paralysis. Typically patients with a severe case of Ramsay Hunt will develop SYNKINESIS. Synkinesis occurs when the nerves are regenerated in an abnormal way causing all the muscles of the face and eyes to activate at the same time. This can result in a “frozen” or a “frowning” smile that appears to be paralyzed and narrowing of the eyes. Furthermore, the forehead and eyebrows may droop and lower lip may not function well. 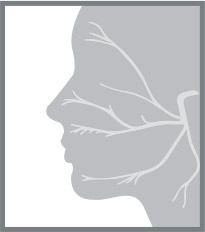 Patients may also have severe tension in the face and neck region. At this time, patients may want to consider seeking the help of a facial nerve expert like Dr. Azizzadeh to discuss treatment options. 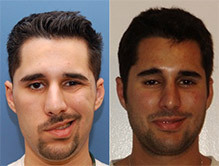 For patients who experience permanent facial paralysis and/or synkinesis brought on by Ramsay Hunt Syndrome, Dr. Azizzadeh has several surgical treatment options. He typically recommends a combination of surgery, botox and physical therapy to combat the underlying problems. Surgical treatments typically involve performing a selective neurolysis with rerouting of facial nerve thereby improving the function of the smile muscles and reducing the activity of the frowning muscles to improve the smile. 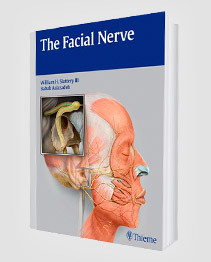 Other procedures such as Cross-facial nerve transplant, temporalis tendon transfer or a masseter-to-facial nerve transfers may be considered but may not be needed depending on the patient’s condition. Dr. Azizzadeh spends time getting to know each patient and together, they devise a customized treatment plan that will meet their specific needs. In addition to surgery and physiotherapy, Botox injections can be very beneficial for patients who are suffering from temporary facial paralysis caused by Ramsay Hunt Syndrome. While injecting Botox, Dr. Azizzadeh can precisely target specific facial muscles to relax which creates a more symmetrical appearance and helps improve function. Dr. Babak Azizzadeh is a world renowned facial nerve expert who specializes in treating patients with various forms of facial paralysis including Ramsay Hunt Syndrome. 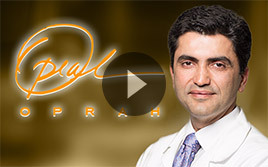 He is a pioneer and leader in the facial nerve world and is highly regarded for his work with both adults and children. Dr. Azizzadeh is double-board certified in otolaryngology and facial plastic surgery which gives him a unique insight into both the aesthetic and function of the facial nerve. After completing his specialized training at Harvard Medical School, Dr. Azizzadeh founded the Facial Paralysis Institute. He is also the founder and director of the Facial Paralysis Foundation, a group which offers information and support for patients and loved ones affected by facial paralysis. Dr. Azizzadeh has been featured in various media outlets including The Doctors, The LA Times, The NY Times, and the Oprah Winfrey Show. He has written 10 best-selling medical textbooks including the widely recognized The Facial Nerve. Dr. Azizzadeh is deeply committed to helping people from across the globe regain their facial function and smile, making him one of the most sought after surgeons in the world. If you or someone you love is struggling with the effects of facial paralysis brought on by Ramsay Hunt Syndrome, contact the Facial Paralysis Institute to schedule a consultation with world renowned physician Dr. Babak Azizzadeh – (310) 657-2203.